Monday, I am not ready to see you. I want to rewind to yesterday when we had a lazy morning at home. The boys actually slept in a little and when they woke up they came into our room and we all snuggled in our bed. I live for those moments. Josh also made Blueberry Sour Cream Waffles for breakfast. It was a pretty perfect morning. It was nice to relax with no agenda. But now, it is Monday and that means it is time to get things done. It is a busy week with lots of go, go, go! I am going to need some major motivation to get me through this week and another Blueberry Sour Cream Waffle. It’s a good thing we stuck some in the freezer. I might have to bust into our stash sooner than later. They will for sure make Monday better! This waffle recipe comes from Joy the Baker’s new book, Over Easy. The book is filled with 125 recipes for brunching, which is the best meal ever. It is the meal where it is totally acceptable mix sweet and savory, the best of both worlds. When then the boys saw the picture of blueberry waffles in the book, they yelled for Josh to come look at the recipe. Josh usually makes waffles every Sunday for the boys, that is his thing, so they knew to go straight to the waffle master. Josh told them he would bookmark the waffles. He made them yesterday and they really made our lazy Sunday morning special. 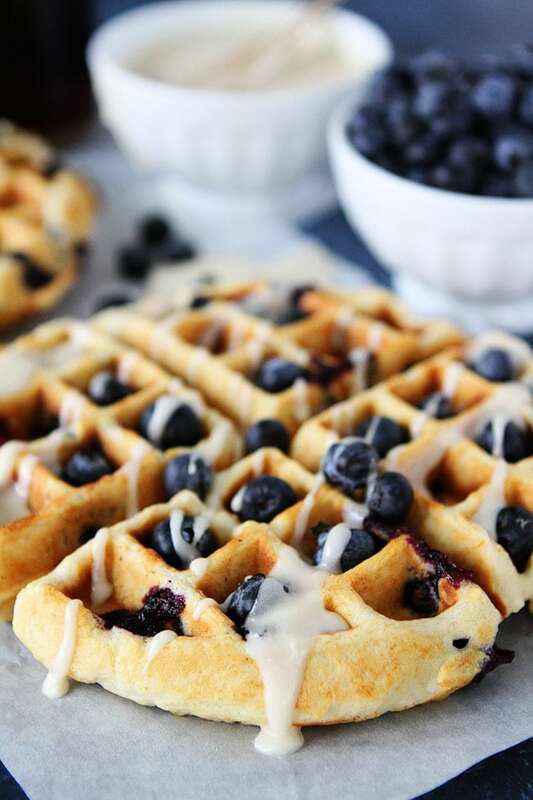 The light and fluffy waffles are dotted with fresh blueberries and drizzled with a sweet maple glaze. When Josh delivered the boys their plates they were beyond excited. They couldn’t believe we were letting them eat waffles with FROSTING for breakfast. They were on cloud nine and ate every single bite. 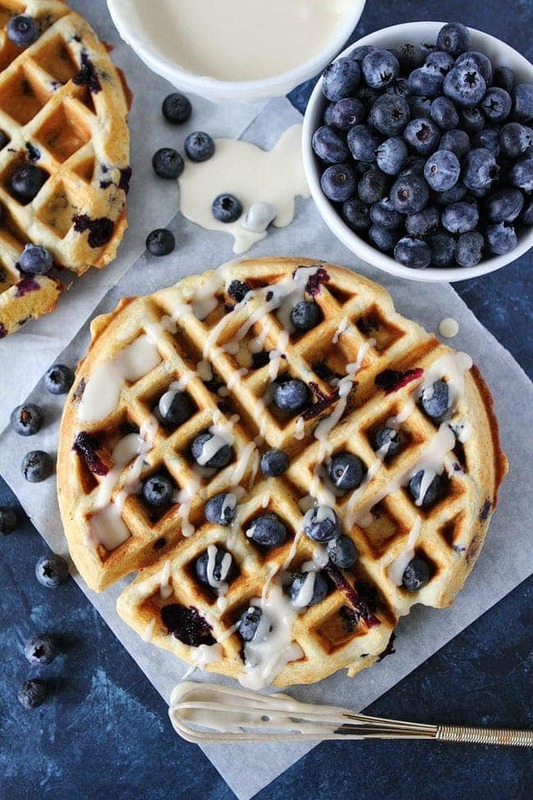 Blueberry Sour Cream Waffles with Maple Glaze are a new favorite at our house. They are going to be a regular on the weekends. Now, hurry up weekend, I like you a lot better than Mondays. Make sure you check out Joy’s new book, Over Easy. It’s a winner! I want to brunch every day. 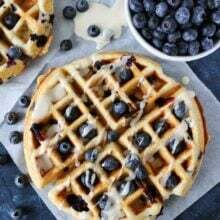 These light and fluffy Blueberry Sour Cream Waffles with a sweet maple glaze are perfect for breakfast or brunch. The waffles freeze well, so make a double batch! In a large bowl, whisk together the flour, baking powder, baking soda, salt, and sugar. 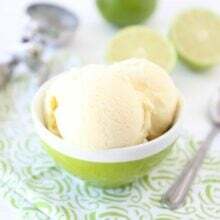 In a medium bowl, whisk together the butter, eggs, vanilla extract, sour cream, and milk until smooth. Pour the mixture all at once into the flour mixture and stir until just incorporated. Stir in the blueberries. Try not to overmix the batter; if a few lumps remain, that is fine. Dollop 1/4-cup portions of batter onto the hot waffle iron. Cook until golden brown according to your waffle iron's instructions. Transfer to a wire cooling rack while you make the glaze. In a small bowl, whisk together the confectioners' sugar, butter, maple syrup, and milk. Whisk until smooth. 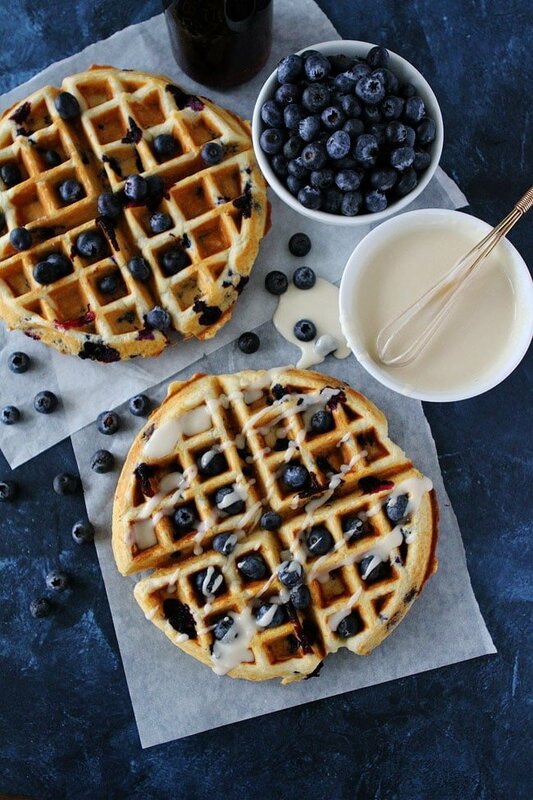 Drizzle the waffles with the maple glaze and top with additional blueberries. Serve. Note-the waffles freeze well. Cool completely and place in a freezer bag for up to one month. To reheat, place in the toaster or microwave. Waffles are my husband’s favorite. I need to give these a try. They look so good! These look delicious! Could I use this same recipe to do pancakes instead? I have no waffle iron and don’t really want one. Great waffles!! I made this as written, although only 1/4 of the recipe and didn’t have blueberries to garnish the waffles with so used mini semi-sweet chocolate chips and then the powdered sugar!!! So good, no syrup needed with this combination!! 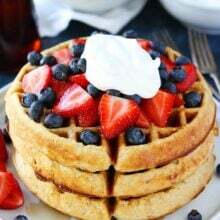 After eating these for breakfast, I made 4 more waffles that I now have in my freezer to have in the future for breakfast, quick and easy!!! Thanks for sharing the recipe. 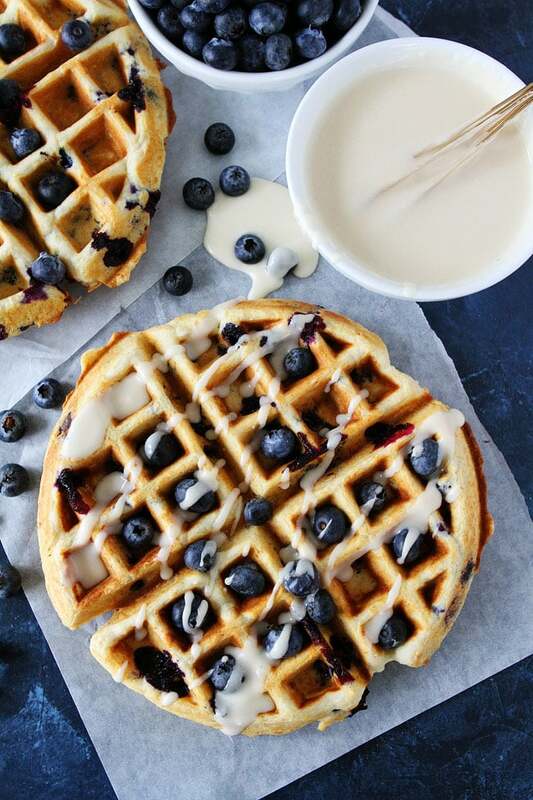 I’ve never heard of sour cream waffles before, but they look incredible! I need to make these over the weekend! Mmmmmm! My favorite combo of ingredients! These waffles look amazing! I want these for Mother’s day! hey girl- these waffles look so yummy! Has anyone tried this with whole wheat flour? We like to use white whole wheat flour and they always turn out great. I am sure whole wheat flour would be good too, maybe just a little denser. Enjoy! Oooooooooh…sour cream, I’m intrigued! 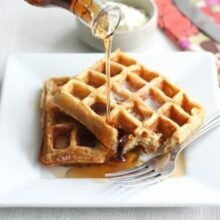 It works magic in so many different types of recipes, but I’ve yet to try it in waffles. These look incredible! Thanks for the recipe! 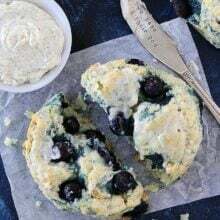 I Just made blueberry waffles this last weekend too- but your have SOUR CREAM!!! wow- I bet those are soooo good! This will always be my idea of a perfect breakfast! I just made these and both of my kids loved them, which never happens! I used white whole wheat flour and subbed plain yogurt because we didn’t have sour cream. Thanks for the recipe! Yay! Glad your kiddos loved the waffles! These are delicious! Have made them twice though and both times the batter has turned out so thick that I have to spread it over the waffle maker. 1/4 a cup also doesn’t seem to be enough to make a complete waffle on our maker. Am I overmixing or is there something else I should be doing to make them pour or dollop better? Thanks! Every waffle maker is different, you might need more to fill yours! The better is thick, if you want you can think it out a little by adding more buttermilk. We loved these waffles! The sour cream was a great addition and the maple glaze is delicious. Thanks for the recipe! Has anyone tried using frozen blueberries for this? You say add more buttermilk if they are thick. The recipe doesn’t call for buttermilk originally-correct? Can’t wait to eat these. We’re making them right now! I don’t see where I say that:) You don’t need buttermilk for this recipe. Super delicious waffles. Especially like the maple glaze. My batter was very thick though, wondering if that is the way it should of been? I will definitely make these again! And again! And again! Delicious waffles! But my batter also was extremely thick; I had to more than double the amount of milk called for in order to get it more batter-y. Wondering if I did something wrong or if it’s really supposed to be that thick? It is a thick batter due to the sour cream. Tried something new and liked it. Family likes waffles on Sunday. They liked them also. This is my new go to waffle recipe. I use it as the base and then add nuts, blueberries, chocolate chips ….. you name it!! Don’t need to change a thing in the recipe!!! Made these, following recipe exactly. Using vanilla paste was the only small difference. They came out fabulously!! They held their shape (I hate a soggy, floppy waffle) and the taste was spectacular! My husband no longer wants to go out to eat breakfast LOL! !